Ideological battles for development form of States in current world political conditions are continuing in the Middle East. The dispute on the possibility or impossibility of introducing Islam in politics, as well as on the interaction of religion and politics in General remains a main break line. Ideological conflicts typical for Europe of the past today are becoming normal for the Middle East. Herein the region remains concerned on the idea of “Crusades”-actions with good ideas but unromantic economic objectives and interests. In Turkey, perhaps the most pro-western country in the region, the ideological confrontation between the Islamists and supporters of secular development has not been decreased during the second half of the 20th century. The Islamists came into power, later deprived of the right to govern by the military coup. It was up to the victory of the justice and development party headed by R.T. Erdogan. A key feature of the party became an obviously temporary waiver of Islamist rhetoric and focus on conservatism, Turkish values when extending the Eastern vector of foreign policy and the preservation of the western one. At the same time, secular forces were deprived of controls through constitutional reform, proceedings “Ergenekon” and “Balyoz” when the university rectors and senior military were jailed. Erdogan began to monopolize power actively, preparing a major attack on the opponents – the creation of a new Constitution, planned for 2013. 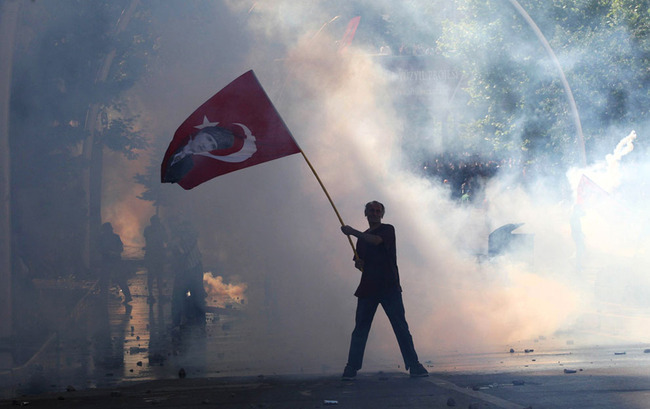 As revealed by the events of late May-early June 2013, the secular power in Turkey was under confinement, discontent has resulted in massive demonstrations, which led to the idea of transforming the Gezi Park in Central Istanbul. But it turned out, that Erdogan was ready for such a development of the situation. Police, which is entirely loyal and remains its main socio-class supporter, dispersed the demonstrators. The media, many of which have changed owners in the last few years under a variety of circumstances, either showed Erdogan “in all its glory”, or did not show anything associated with protests. Left-wing sites were subjected to hacker attacks and could not function normally. In turn, the military ended up abandoning, as had been previously weakened and subordinated to the ruling elite. Turkey of Erdogan’s regime, inspired by its internal and foreign policy successes, still has faced little resistance from the inside, but continues to boil as a pot, crammed with ideas of further development. The Middle Eastern and North African regimes of moderate Islamic type, who claimed to follow the Turkish model, either lose or are on the brink. Syria’s Assad regime strengthened. A number of EU Member States directly or indirectly expressed their unwillingness to take Ankara into European Community, and the rapid growth of economic cooperation of Turkey and Russia comes to naught and is replaced by suspicion, complex interaction of Turkic States in the area of integration and security. In contrast to the “Arab spring” the AKP regime in Turkey has evolved and has all chances to devolve over time, of course, if the left forces or military take power before, which seems unlikely without the involvement of external players interested in the current environment. Vladimir Avatkov, tutor of Military Department and Department of Languages Middle East Countries Language of MGIMO, especially for the online magazine “New Eastern Outlook”.